From the moment of birth the future happiness and development of your child becomes a first priority. 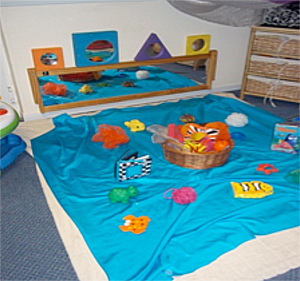 Meynell Kindergarten’s baby care unit offers care for 0-2 year olds with flexible hours from 8am—6pm, a bright and airy play room, a separate cosy sleep room, and the opportunity for them to join their older friends and siblings in music time, messy play, and other indoor and outdoor activities when they are ready. The older babies will enjoy a variety of supervised fun activities during their day with plenty of opportunities to learn new skills. They will begin to explore natural materials such as sand and water as well as discovering pleasures of play-dough, painting and printing. Freshly prepared midday meals are provided. They are nutritious and varied. Any special dietary requirement will be catered for. A Weekly menu is posted on the notice board. Breakfast and Tea is also available on request. Diaries are completed on a daily basis, so you know how much fun they have had during each day!